4 Beds 2 Baths 1 Partial Bath 1,914 Sq. 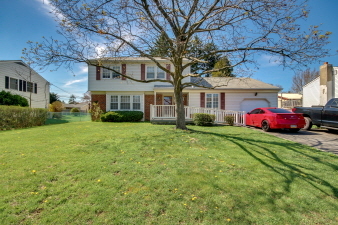 ft.
4 Bedroom, 2 1/2 Bath Center Hall Colonial located in Desirable Delmont Manor. First floor with Gleaming Hardwood Floors, New Carpeting and Freshly Painted Walls. Foyers leads to Formal living room with picture window and ceiling fan. The Dining Room, also off foyer has been combined with the Kitchen to create an open floor plan for entertaining with Enormous Kitchen with Newer Cabinets, Casement Windows, Tons of Counter Space, Three Ceiling Fans and a Nice Sized Pantry. Family Room conveniently located off the kitchen with door to rear yard. One Car Attached Garage with Garage Door Opener and Pull Down Stairs for Extra Storage. The Upstairs Master Bedroom Suite with Bath. Three additional bedrooms and a Hall Bath with Ceramic Tile Floor. Pull Down Stairs Opening in hallway to a Large Attic. All This Plus a Spacious Level Rear Yard and a Convenient Location with easy access to Major Roads, Dining & Shopping.